OnActuate is a global enterprise solution integrator that thrives on making technology work hard and efficiently for growing businesses like yours. Recognizing it is people who drive success, our people first approach is the hallmark of our specialized services. Inherent in our people first approach is taking the time to get to know your stakeholders, working closely in the trenches with leaders to operators, through the planning, development, implementation, and launching of your project. We invest our time and energy in navigating all the stresses large-scale change can present, putting people first for success. We’re not in this business for fast wins, we’re in it to help our clients achieve success. With a track record of 100% client satisfaction, we continue to support every client we’ve ever served. We make it our business to understand the intricacies of your challenges and determine how we can work together to make you successful. That’s why we’re fast gaining a reputation for rescuing stalled projects. You get the full attention of our business process, technology, change management, and solution experts, making sure your project completes on time, on budget, and with unprecedented results. In the face of rapidly evolving technologies, we take the complexities out of making ERP and CRM technology work smoothly and effectively for you. An experienced Microsoft Dynamics Silver Partner, OnActuate delivers Microsoft Dynamics NAV, Dynamics AX, Dynamics 365, and Dynamics CRM solutions as well as Salesforce CRM—we custom build for scalability, business efficiencies, and your long-term return on investment. Our carefully selected system architects, developers, and consultants specialize in large-scale system ERP and CRM implementations, upgrades, DevOps, and digital transformations. And we embrace emerging technologies, including the delivery of digital transformation, cloud solutions, Internet of things (IoT), intelligent hybrid automation, and machine/deep learning. No matter where you are in the evolution of your technology systems, we are equipped with the know-how to move your business and people forward. OnActuate’s people first philosophy is deeply rooted in our culture, putting both our people and your people first—inspiring the delivery of quality in everything we do. OnActuate global teams are tight-knit, knowledgeable, experienced, and our family. When our team joins your team, we guarantee we’ll get the job done. A global entrepreneur and visionary, Sharan Oberoi is deeply committed to the success of those who surround him. As the founder and CEO of OnActuate, he is the driving force behind the company’s fast-paced growth, confidently inspiring the way forward and persistently delivering excellence. Sharan’s career, as a young engineering graduate, began in India where he was instrumental in the localization and launch of Microsoft solutions. This provided a springboard for an orbit that would spiral him from Denmark to Canada, and New Zealand to the USA, consulting with Hewlett Packard, Ernst and Young, and Tectura Corporation. Sharan became a seasoned consultant and large-scale systems integrator serving giant multinational enterprises up to Fortune 500s—including Warner Brothers, Caterpillar, and one of the world’s leading independent commodity trading and logistics houses—and published author of his first book on Microsoft Dynamics. Fuelled by his unstoppable entrepreneurial spirit and fascination for the art of building a successful business, Sharan opened the doors of OnActuate in 2012. The mastermind behind the company’s people first philosophy, he inspires excellence, willingly offering support and encouragement to his teams and clients alike. Sharan was honoured to win Forty Under 40 in 2017. A gentle family man at heart and philanthropist, Sharan is a trusted international business leader and systems’ subject matter expert who pushes the boundaries of technical innovation in everything he does. Ashish Sharan is an advanced technology system integrator and global entrepreneur. An explorer at heart, he is a highly regarded digital transformations expert, who likes nothing better than solving mammoth complex technical problems. His proficiency at leveraging emerging technologies propels businesses to vastly improved efficiencies. Armed with a Mechanical Engineering (BEng) degree, Ashish travelled from India to Australia and the UK; his colourful career moved him rapidly through the ranks, where he became a master of business development, system architecture, and IT and service delivery. Driven to stay ahead of the pack, Ashish became one of the youngest senior managers at Accenture; at just 30 years old was responsible for managing a team of 300 consultants, spread across the globe; became a critical member of the due diligence team on a strategic merger and acquisition; and established a track record for landing and delivering IT services on multi-million dollar opportunities at Accenture and TCS. Given his 20 plus year track record, joining OnActuate in 2014 as partner and leader came at a time when Ashish was ready to create a new and distinct business culture. At the helm of the Asian operation, Ashish is often referred to as ‘the solution man’, and true to his competitive spirit, he remains on the cusp solving real business challenges. And he’s passionate about passing on his knowledge, to his daughter, his teams, and to university students. He can be found lecturing students on campus when time permits, and admits it’s not only a great ‘stress buster’, it’s incredibly important that we share with our next generation how the industry works and how projects are executed in the real world. Armed with a Mechanical Engineering (BEng) degree, Ashish travelled from India to Australia and the UK; his colourful career moved him rapidly through the ranks, where he became a master of business development, system architecture, and IT and service delivery. Driven to stay ahead of the pack, Ashish was responsible for managing a team of 300 consultants, spread across the globe; became a critical member of the due diligence team on a strategic merger and acquisition; and established a track record for landing and delivering IT services on multi-million dollar opportunities at Accenture and TCS. Naeem Shafi is a high-caliber project manager with an extraordinary ability to bring together talent and technology to get large-scale complex projects done and done well. Highly familiar with navigating the challenges of organizational change, he’s gained a reputation as an inspirational coach and motivator. Naeem ranks helping his clients succeed as his number one priority. Educated in Oxford, UK, Naeem has worked on every continent serving high profile companies, including Bell Canada, Ford, Jaguar, Audi, and Hitachi. He has systematically honed his skills, becoming responsible for ERP supply chain implementation program management, across multiple countries, from concept to final handover. Cool under fire, Naeem takes managing complex systems—where the downtime cost per minute is as high as $5K US—in his stride. Ready for a fresh challenge, in 2013 Naeem joined OnActuate as a partner, visionary, and leader of the North American operation, bringing his over two decades of rich experience to bear on building a global solutions integrator. An innate problem solver, Naeem attributes a post-graduate stint early in his career—in overalls on the shop-floor (at the Mars UK Supply chain distribution site)—to giving him a baseline perspective that made him the trusted expert he is today. Naeem is personable and an excellent communicator who has been invited by Microsoft to speak on the topic of project management. Deeply committed to life balance, Naeem values family time and a good game of cricket. 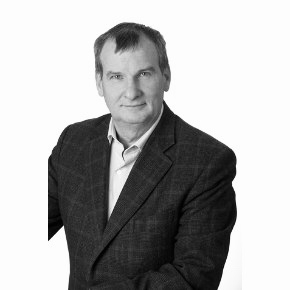 Dennis has over 30 years of experience in the technology sector. Bilingual, (English-French), he has an extensive background in both application software and services delivery in North America. He has a deep understanding of application and enabling technology solutions that have provided clients in the commercial and public sectors with the system solutions needed to meet their business transformation objectives. Demonstrated alignment to corporate goals with the ability to grow the target sector and geo practices to be sustainable operations for the longer term. Looking for ERP and CRM advancement in your business?